On June 26th 1721, after much research with Reverend Cotton Mather, the first inoculation in American history was completed by Dr. Zabdiel Boylston at Boston. Dr. Boylston made a small wound in three patients, and the pus of active smallpox was smeared into these wounds. The result was that the people deliberately infected by the smallpox received a mild case of the deadly disease, and thereafter had complete immunity to it. The three subjects were an adult male slave named Jack, a male two-year old slave named Jackey, and Dr. Boylston's six-year old son. This event can be considered analogous to what is known today as a clinical trial. Smallpox was a terrible scourge to humanity. In Colonial Boston, horrific outbreaks occurred in 1640, 1660, 1677-1680, 1690, 1702, and 1721. Hundreds of people were killed by the disease with each outbreak. This first inoculation in Boston is very historic for two reasons: Religious faith opposed experimentation on the human body at that time, and the medical profession had not yet even conceived the use of laboratory analysis to treat diseases back then. The prevailing religious view of 1700 was that smallpox was a judgment of God upon humanity, due to the sins made by humanity. It was believed that trying to prevent smallpox could provoke God, and a wrath of greater consequences might be made on humanity if experimentation occurred. Reverend Cotton Mather and Dr. Boylston believed that faith and clinical empiricism together could save many lives from smallpox. Their decision caused great dissent, and drew much criticism upon themselves. From the time of Hippocrates c.400 BC to the mid-1800s, the medical profession used observation and logic to diagnose and treat diseases. In very general terms, medicine did not advance at all for over two thousand years due to this. If a person looked very red by observation, then they logically had too much blood. The treatment was therefore lancing and bleeding the patient. Reverend Mather did much research into smallpox inoculation, and concluded that an animacular (germ) is likely a cause. The work by Mather and Boylston led the way for later scientists like Edward Jenner and Louis Pasteur, who developed clinical methodologies and engaged in controlled scientific experimentation. 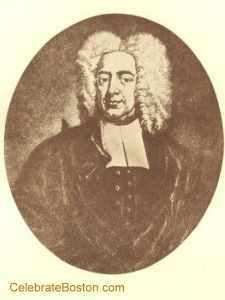 Cotton Mather was first made aware of smallpox inoculation by an African slave in 1706. Mather then investigated use in other parts of the world by communicating with London physicians and other sources. Inoculation is a method of infecting a person with a disease in a mild way and for them to then overcome it, unlike later developed vaccinations in which the patient usually does not get the target disease. Using data from later Boston smallpox epidemics, the mortality rate of those inoculated was only about 2.5%, compared to 14% of those infected naturally.